Fred Sandback: Sculpture. Rhona Hoffman Gallery, Chicago. March 15-April 19, 2002. 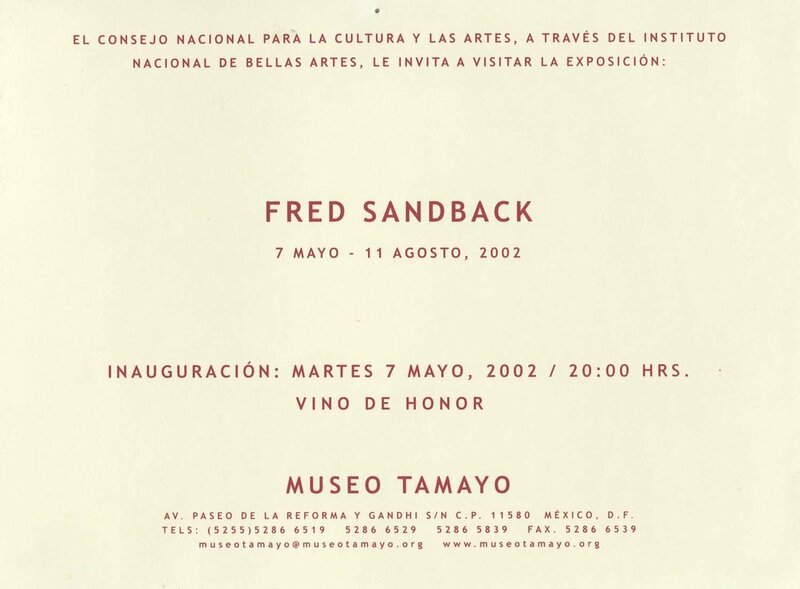 Fred Sandback. Galerie Meert Rihoux, Brussels. April 26-May 25, 2002. Fred Sandback: Escultura. Museo Tamayo, Mexico City. May 7-August 11, 2002. Josef Albers, Donald Judd, Sol LeWitt, Brice Marden, Allan McCollum, Fred Sandback, Bill Wheelock. Barbara Krakow Gallery, Boston. January 19-March 13, 2002. Dialog: Ordnung und Spiel. Kunstmuseum Liechtenstein, Vaduz. February-August 2002. Acquisitions 2000 du Fonds National de l'Art Contemporain. Galeries Poirel, Nancy, France. February 27-April 28, 2002. Pièces de la collection. Ecole Supérieure des Beaux-Arts de Nîmes, France. Opened May 2, 2002. Drawings of Choice from a New York Collection. Krannert Art Museum, University of Illinois, Champaign-Urbana. September 4-November 3, 2002. Traveled to: Arkansas Arts Center, Little Rock, November 14, 2002-February 2, 2003; Georgia Museum of Art, University of Georgia, Athens, February 11-March 23, 2003; Bowdoin College Museum of Art, Brunswick, Maine, April 10-June 8, 2003; Cincinnati Art Museum, Ohio, August 22-November 16, 2003. Network. Annemarie Verna Galerie, Zurich. September 10-28, 2002. Les années 70: l'art en cause. CAPC Musée d'art contemporain, Bordeaux, France. October 18, 2002-January 19, 2003.